Kidznfun :: Destination: San Francisco - Family Fun in the City! It starts when we head over the Bay Bridge. The city unfolds, with the Transamerica building grounding the city; the freighter ships heavy with cargo; the fresh sea air; and the required traffic. What adventure will we find on this trip to San Francisco? Like any large city, San Francisco is made up of many neighborhoods, each with a unique personality. Whether it’s the transformed SOMA, Fisherman’s Wharf, Pacific Heights, Union Square, Chinatown, North Beach or the Marina, each neighborhood offers a unique family experience. We have hit a few, look for more inside reviews to come. San Francisco encompasses 47.335 square miles. It has 29.5 miles of shoreline and 850 miles of streets. It has 227 parks, playgrounds and squares. There are over 30,000 hotel rooms in the city. And almost ten million cable car riders. There are five bridges leading in and out of San Francisco. The Golden Gate Bridge is 1.7 miles long. Over a million people a year visit Alcatraz. 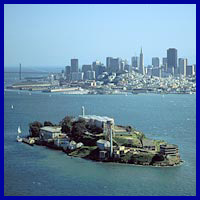 The official ballad is “I Left My Heart in San Francisco”. No surprise there. There’s so much to explore. You can go the tourist route and hit the major attractions: Fisherman’s Wharf, Chinatown, Golden Gate Bridge, Union Square and a Cable Car ride. Or you can take your time and explore one neighborhood in depth. Following are some articles and tips to make your adventure into San Francisco a great family adventure.